Perfect for the ideal skiing holiday or multi - winter activities, here at Calendar Lady we have an ideal promotional gift to ensure safety and relief to take the nip out of a cold day. 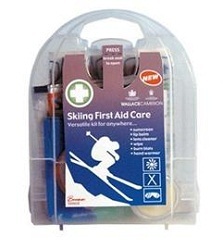 our Promotional Skiing Kit has the ideals and necessary items: Sun Cream, Burn Gels, Wet Wipes, Plasters and Lip Balm. Perfect for a winter business vacation, hand these out at business trade fairs and ensure safety for clients and customers! For a FREE QUOTE please fill in our contact form regarding our Promotional Skiing Set and we'll be able to help you.